Next time I go to Baton Rouge, I hope I’m not in a big hurry. A few months ago I had a couple of days notice before I travelled – time enough to get a hotel reservation and pack my bucket lists. That one worked out just fine: thin-fried catfish, turtle soup, and some fresh boudin made for a memorable journey. On my return trip several weeks ago, I got word at two in the afternoon that I had an appointment at 9:15 the next morning. This was a little more challenging, but not to worry – I found something to eat. On this second trip, though the departure was late, I had already checked in with Aunt and Uncle in Baton Rouge to make tentative housing arrangements. My arrival would be well past the normal dinner hour, but they very generously waited on me to eat – and I was very happy that they did. We dined on cashew-encrusted crappie that Uncle had caught himself. The original recipe called for macadamias, but after experimenting with various nuts they had settled on cashews. I ate more than my fair share, and would have surely kept going had the hour not been so late. I suppose a new tradition of eating fish the night before I have meetings in Baton Rouge has been set. Around mid-morning, as I was completing my last business-related task, I ran across a little donut shop called Mary Lee Donuts. My kinfolk had provided breakfast for me, so it wasn’t like I was hungry, but I agree with comedian Jim Gaffigan: what does that have to do with anything when it comes to donuts? I could just tell myself they were for the road. Yeah, that works. I walked in and was faced with an unexpected choice. There were two apple fritters: one was baked and one was fried. Two thoughts came to mind. One: clearly these people didn’t know who they were dealing with. Though the baked pastry looked interesting (and huge), I’m choosing fried every time. And secondly, is it really a fritter if it isn’t “frite”? But I kept these thoughts to myself, smiled, and enjoyed my sweet, dense, fried fritter all the way home. At that point, it was only about 10:30 and I was done with all I came to do (officially) in the capital city. But there was still some unofficial eating to be completed, and I wasn’t going to let a silly thing like the time of day hold me back. The night before, I had quizzed my kinfolk about where I could eat lunch. 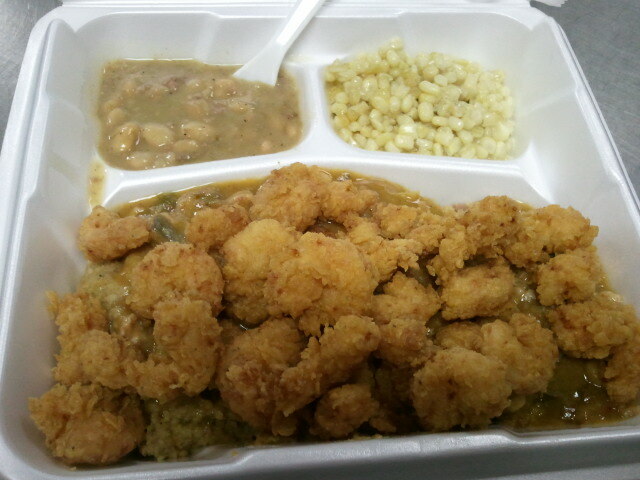 After my last trip, I had heard that Piccadilly cafeteria was known for having the best crawfish etouffee in town. 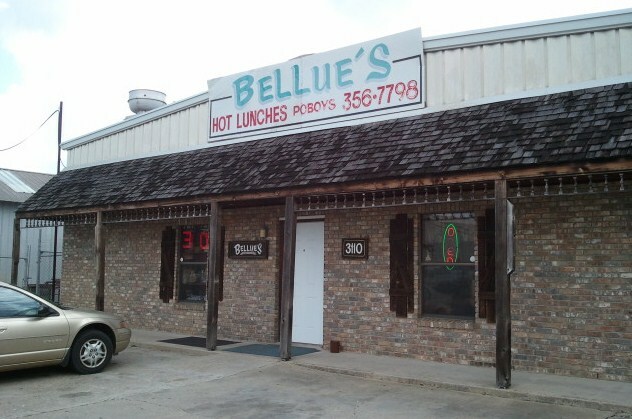 They, too, were familiar with that story, but their son-in-law (which I suppose makes him my cousin-in-law) happens to be a chef, and on a previous visit had sought out a place called Bellue’s that was supposed to have great Cajun food. For this trip I chose cousin over cafeteria. I called to make sure they were open that early, and set my Gleaux-bal Positioning System towards the refinery. 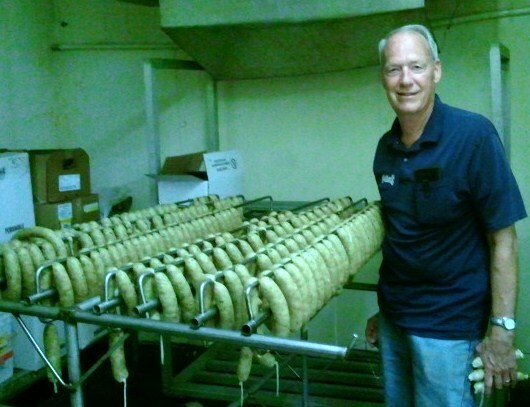 I walked into Bellue’s Fine Cajun Cuisine to face an icebox full of sausage and other specialty foods ready to take home. (Thankfully, I have learned to keep a cooler in the car at all times for just such emergencies.) That would come later, but I made a mental note of a few things and turned to my left to study the menu. I make no claims to be an expert on Cajun food, so I asked the nice lady (who turned out to be a Mississippi native) what she recommended. One of the most popular dishes, and that day’s special, was the Crawfish Etouffee Supreme, described as rich, creamy gravy served on a bed of cornbread dressing topped with either fried shrimp or fried fish. The one other customer in the building assured me it was the right thing to do, adding also that I could count on getting at least two meals out of it. I was sold. And he was right on both counts. I found the combination of etouffee and cornbread dressing to be rather unique, the crunch of the fried shrimp adding even more flavor and texture to this Cajun comfort food. With the two sides (white beans with Tasso ham and smothered corn) plus a complimentary hush puppy while I waited, I didn’t even attempt to eat it all. Since I was the only one around at the moment, I asked the nice lady from Mississippi about the restaurant’s history. Here’s the short version as I remember it: Mr. Bellue was a police officer who later opened a welding shop near the oil refinery, then began cooking for the refinery workers. Over time the food became so popular that Bellue’s turned into a full restaurant, catering service, and mail-order business. As I was winding down, Mr. Bellue showed up and brought out a piece of deep-fried boudin for me to try – a much better bite than any old boudin ball I’ve ever had. When I told him about my interest in all things edible, he invited me back to see his operation. While he made no claims to be a trained chef, he did admit to being a perfectionist. His recipes were precise. Much of his equipment was either invented by him or adjusted to fit his needs (i.e., made better) in his welding shop next door. His systems were set up for consistency and efficiency. I seriously think I could have walked in and been ready to work for him with a day or two of training. He told me that he did what he did out of love, and it showed in his food and his kitchen. I loved it, too. Baton Rouge, I’ll be back. For many years I was the traveler in the family. My job overseas required a fair amount of international travel, and I didn’t mind that. It was sometimes tiring and I would miss my family, but I still loved being able to say I had been to such-and-such a country, even if most of my time there was spent inside a meeting room. Though I was in the air a good bit, most of the places I went were accessible in just a few hours and a couple of connections. It was a different story for The Wife. Travel was not her thing, but every now and then she took a turn. But while I was flying next door (if you consider across the Red Sea to another continent “next door”), she would go places that took two days to get to, either because of distance (like Thailand) or bizarre flight schedules (like Cyprus, whose motto might as well be, “You can’t get here from there.”) This time she crossed the space-time continuum, lost a day in the process (but got it back later), and went to China, all just to bring me snacks. What a woman. Okay, she did see the Great Wall, Tiananmen Square, and a really big Apple Store. But she didn’t bring any of that back home. She did bring snacks. To be fair, I also got a nice t-shirt that proved extra-large is not a universal size, a carved pig head on a string (for the barbecue lover in me), and a wire sculpture of a man playing a drum set. All awesome. And she brought snacks. One of the things I learned in our years abroad (which you can also learn in the tasting room at the World of Coca-Cola) is that tastes vary from country to country. The formula for Coca-Cola is not necessarily the same in Djibouti (and they drink a lot of it) as it is in Jamaica or Japan. In the Middle East we got Mango Tang. Not only does it taste delicious, it also rhymes. 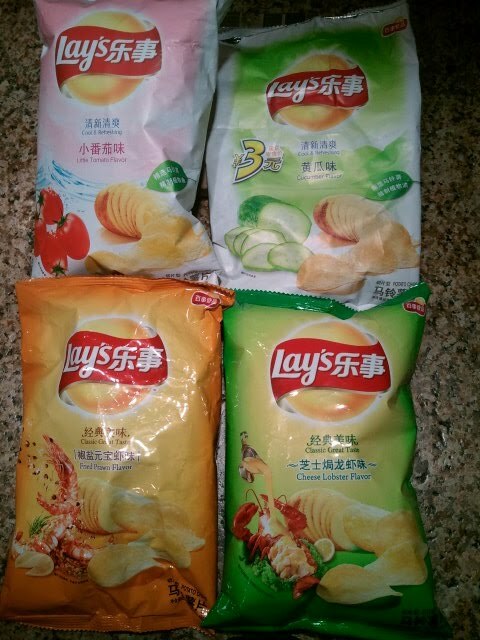 Some of the fun stuff The Wife brought back from Beijing fits the same pattern: familiar name, unfamiliar flavor. For instance, Daughter got a roll of grape-flavored Mentos. Mine was called “Fresh Cola.” That was a bit scary, given that a roll of minty Mentos dropped in a Diet Coke will produce an instant fountain. (Kids, do try this at home, but only with adult supervision.) What would happen in my mouth if the Mento and cola were already combined? Same song, different verse for the Lay’s potato chips. The barbecued steak flavor was very similar to our barbecue chips here. The cucumber chips tasted pretty authentic. The “Little Tomato” chips reminded me very much of the ketchup-flavored chips we used to get at the same store where we bought the Mango Tang. Then there was the Cheese Lobster bag. They were cheesy. And lobstery. Not awful. And much better than the Fried Prawn chips. Insert full body shiver here. I also got a bag of something labeled “Hawthorn Pearls.” The picture of the fruit on the bag looks something akin to a cherry. The candy inside turned out to be a narrow fruit roll-up kind of thing. The flavor was fruity – that’s all I could say – and according to the ingredient list it consists mostly of Hawthorn. And my research assistant (we’ll just call her Siri) found out that the Chinese Hawthorn is very much like our Mayhaw, seen every now and then in jelly form. The prize for most interesting, however, had to be the duck wings. Yes, I got a bag of individually wrapped duck wings. I opened the first one and took a small bite. Not bad, but before taking another bite I rinsed off the gel in which it was encased. If you are not familiar with this kind of gel, buy a cheap canned ham. You’ll figure it out. 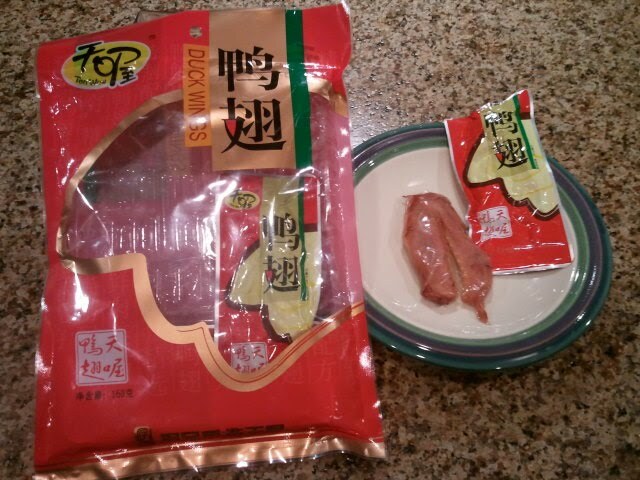 And after a few bites I realized, that’s what these duck wings taste like: cheap canned ham. I was really proud of The Wife for thinking so far outside the box with these souvenirs. Then she began to tell me the tales of what she had eaten. I admit that I was a bit jealous. Let’s see if you are, too. We didn’t get to talk a lot while she was gone, but when we did, we made it count. Like the time she said, “I ate dog today.” As the story goes, some of her traveling companions decided they wanted to try it and set out to find some. It wasn’t easy, but they eventually found a place that served it. She said it tasted like greasy roast. And if you are wondering, these are not just random pooches hijacked from the street – they are raised for food. That may not make you feel better, but it was worth a try. I didn’t think she could possibly top that, but I was so, so wrong. An American they met while there took them out to eat, and ordered a meat-filled dumpling. They asked her not to reveal the type of meat it was until they’d finished it. And it was donkey. Donkey dumpling. Nice ring to it. She did a lot of shopping at outdoor markets, where she found just about anything in the world that can be found. Apparently you can find just about anything edible the world has to offer as well. She could have had starfish, but it was too expensive. Not so for the scorpion on a stick. Or the seahorse on a stick. Those were more affordable, and didn’t taste too bad. And you thought I would deep-fry anything. I didn’t expect so much pushing this summer. Pushing my way through a wall of heat to get to my car. At 730 am. Pushing a mower around the yard, through the aforementioned wall of heat. Pushing my kids to get out of bed when I go home for lunch. And lots of pushing other people’s suitcases. From the last day of school through the 4th of July weekend, there have been just fourteen days when all four of us have had feet on the ground in Starkville. And for the rest of the summer? No change in sight. We have a few more “together days” calendared out before the travel starts up again, then it’s back to school. And I’m good with that – really I am – even though the extent of my personal participation in these summer excursions has been scarce. That means I don’t have a lot of travel food stories to share here in the heart of the season, but as this summer’s token homebody, culinary opportunities of another sort have come my way. For most of the first two weeks of summer The Wife was the one flying the friendly skies, leaving me in charge of feeding the munchkins. In the past it was easy: I would proclaim it Hot Dog Week and tune my creativity towards developing a multitude of hot dog recipes without repetition. But as I have previously mentioned, Daughter has been convinced that a person’s taste buds change once every seven years (overnight, to hear her tell it) and apparently the hot dog-loving bud left the building after that special week. Who could blame it, really? This time I had a simple goal: create space. That meant using every possibly edible item in our cabinets, refrigerator and freezer while at the same time going to the grocery only for the essentials. In other words, every meal was an episode of Chopped. Our first weekend as a wife-and-mom-less crew was Memorial Day. There were lima beans that had been in the freezer for way too long. I was of a mind to do something creative, and pulled up a cobweb-draped memory of a lima bean puree. I did some digging and found a recipe for lima bean hummus, made much the same way as ordinary hummus, with tahini and olive oil, the main differences being the featured legume and the type of seasoning. The resulting dip was a little sweeter than chick-pea hummus, a lot greener, and a bit more complex due to the mix of herbs I happened to have on hand. It was a big hit with Mama and Aunt Kathy. Score one. Another major freezer-space eater was three bags of chicken wings I had accumulated from Beaverdam Farms. I had never done wings before, but the words “never before” are not very strong deterrents these days. The other deciding factor was the deep fryer. The Wife is not opposed to fried food, but we have an open floor plan, and she is not fond of the deep-fried aroma it spreads throughout the house. (I, on the other hand, am on the lookout for Scentsy to create a Hot Fat fragrance.) The timing was perfect and I was thrilled with how they turned out. I already had multiple barbecue sauces handy and made some buffalo-ish sauce with melted butter and Sriracha. As a side I thin-sliced potatoes and beets and made chips. The beets were almost tolerable that way. And I managed to get the fryer cleaned up and put away before The Wife returned. Score two. Lest any reader may have seen me at the grocery store during these two weeks, I suppose I should define what I mean by essentials. If you were guessing milk and bread, you’d be mostly right. But as a reward for all the room I was making in our pantry, I allowed myself to test a few limited edition ideas. I have a love-hate relationship with Pop-Tarts. I love them. That’s the love part. And allow me to say that any Pop-Tart without frosting is an abomination, unless you are planning to batter and fry it and drizzle it with caramel sauce. And even if I might, I bet you aren’t. I hate that I cannot keep a box of them in the house for more than about 24 hours. I will eat them three times a day if they are within reach. Breakfast pack, snack pack, dessert pack. Finis. It was even worse when I discovered the new “Gone Nutty” variety with chocolate frosting and peanut butter filling. Oh my gluten. Score three. Then came the Strawberries and Cream-flavored Oreos. I rarely buy original Oreos unless I need them for a recipe, for much the same reason I rarely buy Pop-Tarts. It’s because I love them. But if I go to the store, I almost always check to see what new flavor combo has arrived, and there are precious few that I have missed. Score F’oreo. How about those little cups of mini cookies? Oreos, Nutter Butters, Chips Ahoy? If you ever use the Express Lane at Kroger, you can’t miss them. Comic Tim Hawkins confirmed something via Twitter that I had never considered, but should have: “dumping a package of mini-Nutter Butters in milk and eating it like cereal IS delicious.” Turns out you have to eat them pretty fast or the cookie part turns to mush, but that’s no reason not to go for it. Not to be outdone, the mini-Oreos were fabulous smothered with a combination of Activia strawberry yogurt (for the health) and a Dannon Strawberry Explosion yogurt drink (for flavor and texture). Cinco de Score-o. Bless my heart, I have run out of space and haven’t told you what The Wife ate on her trip. Stay tuned. And be afraid.